Click for larger version you can view in its entirety. Lionsgate has claimed some or all audio and visual content in your video First Blood (1982). This claim was made as part of the YouTube Content Identification program. 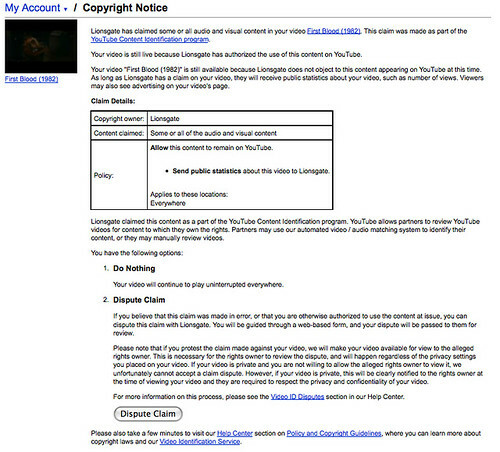 Your video is still live because Lionsgate has authorized the use of this content on YouTube. Your video “First Blood (1982)” is still available because Lionsgate does not object to this content appearing on YouTube at this time. As long as Lionsgate has a claim on your video, they will receive public statistics about your video, such as number of views. Viewers may also see advertising on your video’s page. 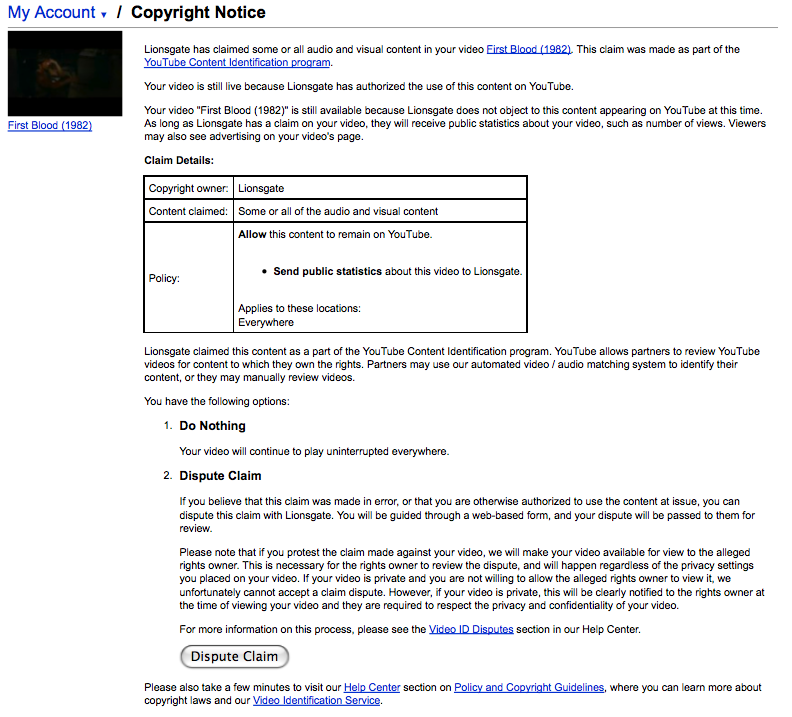 Lionsgate claimed this content as a part of the YouTube Content Identification program. YouTube allows partners to review YouTube videos for content to which they own the rights. Partners may use our automated video / audio matching system to identify their content, or they may manually review videos. So, looks like Lion’s gate doesn’t mind folks uploading pieces of their movies to YouTube as long as they can track the stats. In truth, the biggest thing that bugs me about this policy is that it doesn’t apply to pieces of all films and that they don’t allow others to embed in their sites. Videos on YouTube, particularly feature films, are about contextualizing a discussion, not about watching a film. It is a form of quoting and I want to give credit and rights, but I also want to be able to discuss the culture within which I have lived and continue to live with a certain amount of freedom. Particualrly, I don’t want to have to worry about being sued or targeted as a criminal because I enjoy discussing movies with others. This policy seems to me an interesting experiment towards acknowledging and negotiating how people are using YouTube to frame such conversations (another reason why embedding is key). The stats remain, and more importantly an online community is discussing and thinking about their film, which means they will probably find some way to see it in its highest resolution, particularly if they are movie fans. And as with most movie fans, it most likely means buying or renting the DVD. How easy are they making this process? So, am I being naive here? Has this been going on for a while with official notices letting you know they know, but also that it is kosher under certain conditions? This entry was posted in Uncategorized, YouTube and tagged community, copyright, embedding, experimenting, film, First Blood, upload, video, videos, YouTube. Bookmark the permalink. 2 Responses to YouTube experimenting with copyright? You know, I had a similar experience with YouTube when I posted parts of a Simpson episode for use with a gifted education class. Fox was not as obliging as Lionsgate though and the video was pulled. I appealed under the fair use porion of the copyright law but no dice.